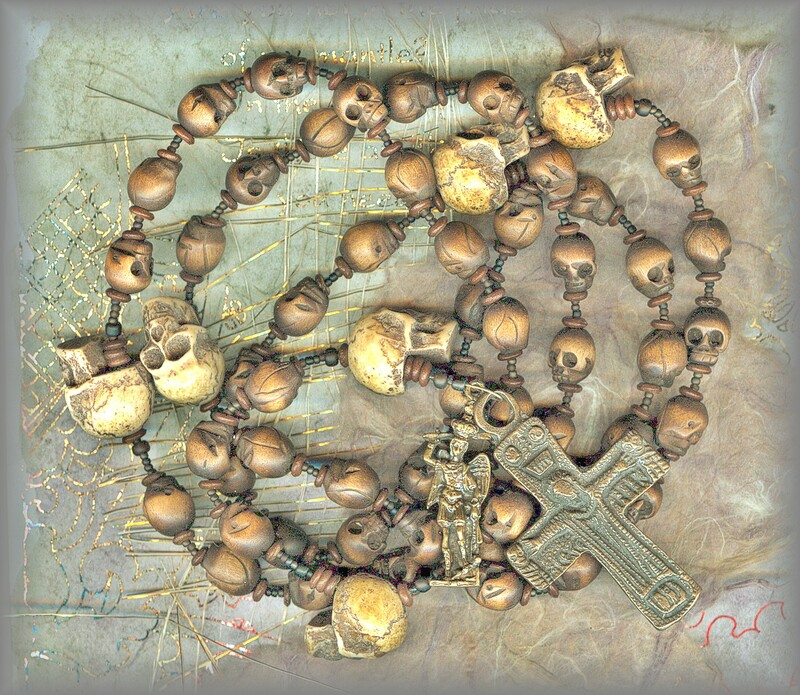 skull rosaries & chaplets - read more about ' Memento Mori"
RDLM.2800 - (pricing) "ATONEMENT ROSARY II"
Where do we go to understand why skulls were / are used in rosaries and chaplets? 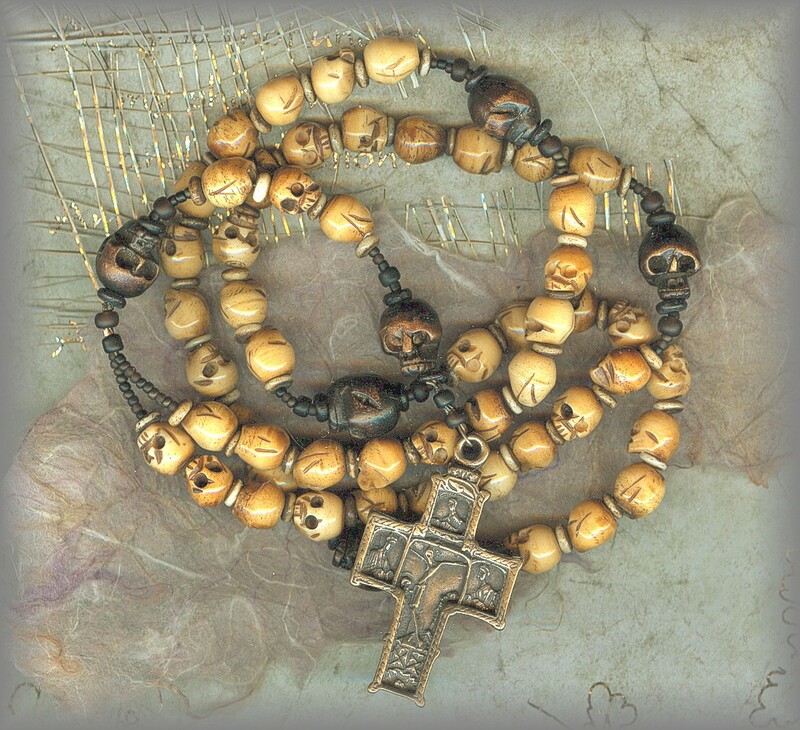 We can track the use of skulls in prayer beads, rosaries and chaplets back to the late middle ages (1066-1485) . The custom was especially popular from the 15c through the middle of the 19c in Italy, Germany and Mexico (from Spain) with religious (priests and nuns). 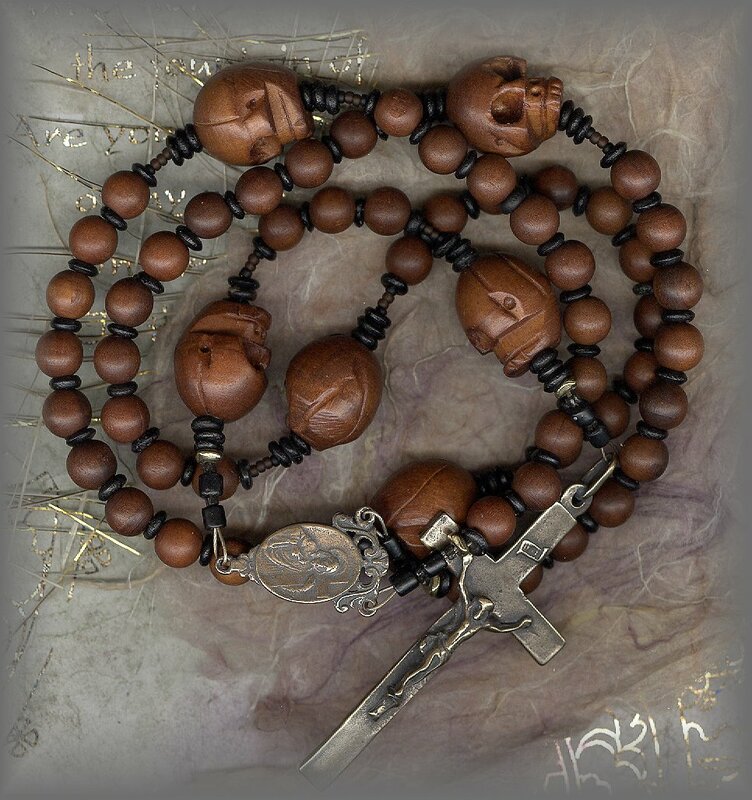 This first rosary was especially designed for Father Robb's at his request. He loves to show it to the children at our local Catholic school (they love it!) and it gives him a chance to talk about the teachings of the church in 3 parts (Those on Earth - Militant, in Purgatory - Penitent and in Heaven - Triumphant). 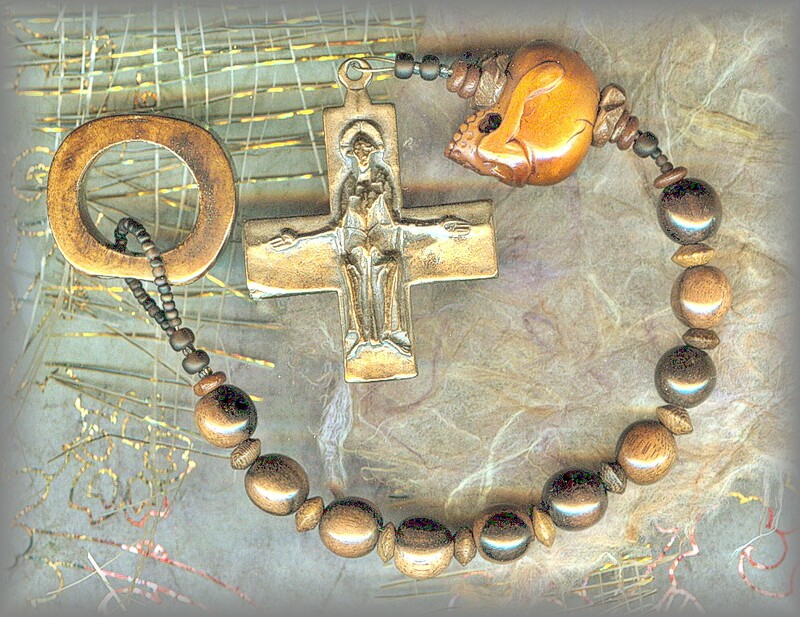 For more information on any crucifixes, medals or rosary centers, go to SUPPLIES at top of page. Available in sterling silver and solid bronze. All hand cast from antique pieces. solid bronze - sorry, no chaplet available. on pricing or to order click link above. rise again, it would have been useless and foolish to pray for them in death. AVE BEADS: Deep, rich fine graned brown wooden beads. 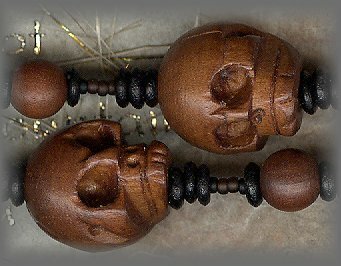 PATER BEADS: Individujally hand carved skull beads of fine wood. Limited, May be unable to replace as shown. ....... 44 for if he were not expecting the fallen to rise again, it would have been useless and foolish to pray for them in death. 45 But if he did this with a view to the splendid reward that awaits those who had gone to rest in godliness, it was a holy and pious thought. 46 Thus he made atonement for the dead that they might be freed from this sin. 'Splendid Reward' and "Atonement' for the dead. 46 Thus he made atonement for the dead that they might be freed from this sin. AVE BEADS: Deep browns in wood give a bit of peace. 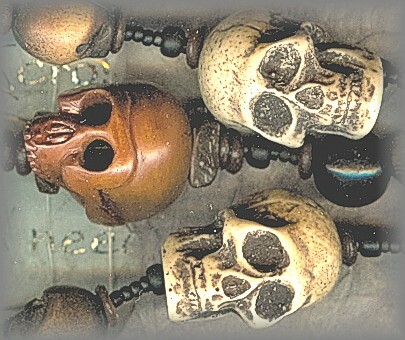 PATER BEADS: Bright multicolored skulls bring a smile to ones face! 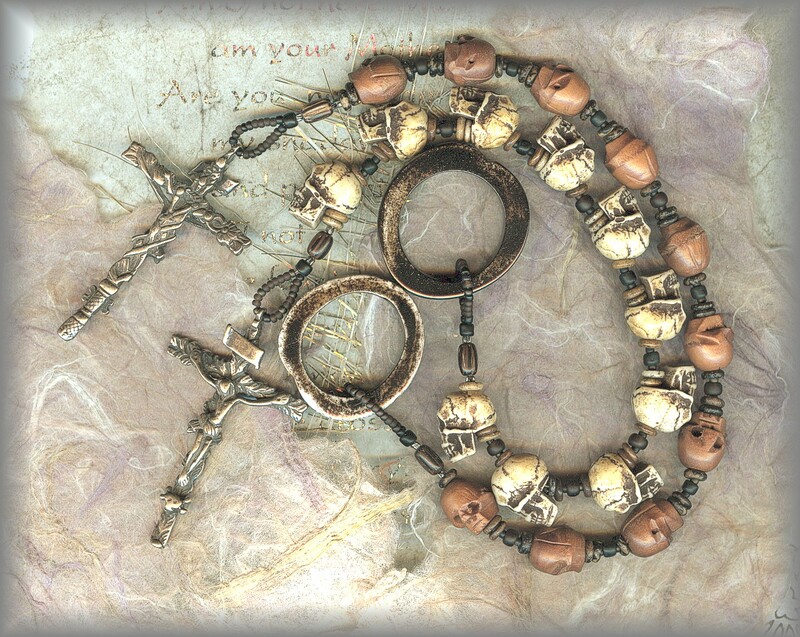 We were surprized these rosaries sold before they were even on the internet. Kids love them! And a great teaching tool. But couldn't help merge the idea too, of the rainbow and how in Genesis, Gods promise tied together. 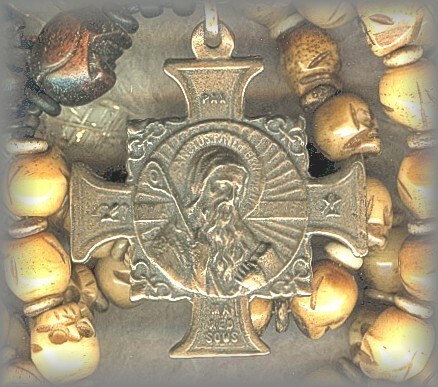 So Victory Over Death' seemed to be the perfect name of this rosary. But how is this celebrated within the Church? All Hallows Eve is celebrated on 31 October as the vigil of two feast days: All Saints Day (1 November) and All Souls Day (2 November). It is a day to pray for the dead and help release them from purgation, evil, thus skeletons, devils, ghosts, witches and the like became the theme. In Latin America these combined days are called 'Day of the Dead' or (Dia de la Muertos). See more under Pictures and links above. 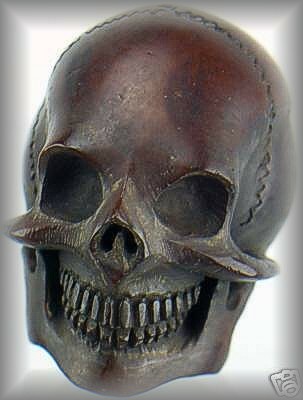 AVE BEADS: Little hand carved Ave skulls keep company with hard to find dark wooden skulls for PATER BEADS. Also available with the St Benedict Cross (below) in cart. The rare crucifix shown below is from the Greek 'Treen' style which carries two small skulls at the foot of the cross, symbolizing Adam and Eve or 'Victory over Death.' Christ: the second Adam, Mary, the second Eve. 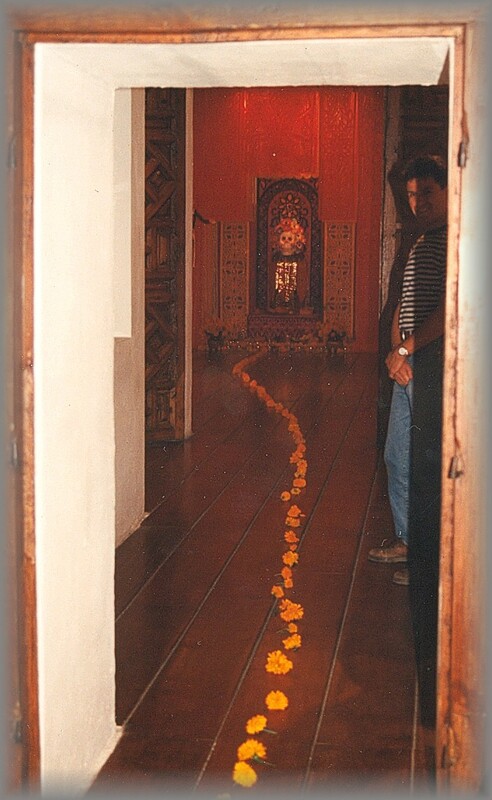 An ancient tradition. 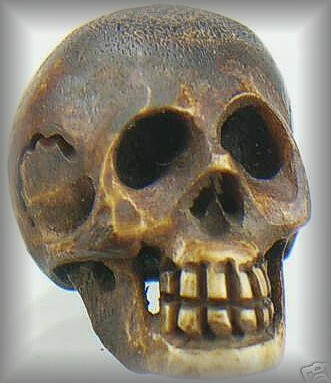 Actually, skull beads are universal and have been used as prayer counters in almost all religions on earth. Carved from wood, bone, ivory and sometimes seen formed in crystal. They are often two faced, one of a mans face, the other his skull. Crystal skulls were very, very popular. They were part of the term 'memento morie' or 'remember thy death'. And whoever speaks a word against the Son of Man will be forgiven; but whoever speaks against the holy Spirit will not be forgiven, either in this age or in the age to come. I will put enmity between you and the woman, and between your offspring and hers; He will strike at your head, while you strike at his heel.". Ya gotta love 'em or hate 'em! 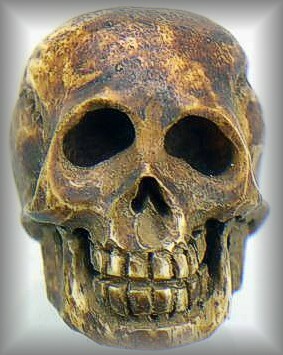 OF ADAM'S SKULL & GOLGATHA ? Father Joseph wrote: "When I was in grammar school my dad's uncles from Croatia and family would go to the graveyard the week before Easter to visit family graves. We carried with us special cakes, food and special wine to spread a table cloth over the family plot and had a nice party eating and talking about the departed loved ones. My special duty was to bury the mass cards under the head stones to remind Grandpa and other family members that we were remembering themm and praying to get them out of purgatory. I remember my dad sharing a glass of wine with his dad by pouring it out over the grave." O Gracious Lord...in this place you give peaceful rest at the price of your life renewing blood. Wherefore you are the most gracious pardoner of our guilt, the most considerate judge, the lavish dispenser of clement judgement, we beg you to forget the severe judgment.and holy justice which we deserve, and only remembering only the mercies of your holy redemption, be to us an advocate and reconciler. Graciously purify and reconcile of those wanderers who await a place of dwelling in your in the heavenly fatherland. And we wait for the day when the Lord will awaken the bodies of them who are interred here by the power and goodness of Christ's glorious resurrection, to incorruptible glory, calling these souls not to condemnation but to beatification. Thank you so much for the special rosary to pray for the holy souls in purgatory rosary. This was a BIG BIG surprise. I must admit it is a reminder of the grace and prayers that are needed for souls to make it to God's heaven. Where in the world did you find those skulls and what are they made of? 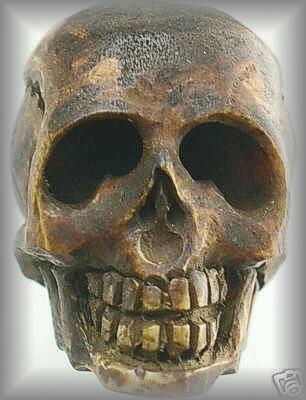 LEARN MORE ABOUT THE SKULL IN ART BY FOLLOWING THE LINKS BELOW AND ALSO USE THE SEARCH BELOW BY ENTERING 'SKULL' TO SEE ALL ON OUR SITE. and did you know about this?